Albariño is an aromatic grape that produces a wine that is a pale golden yellow color. Rías Baixas Albariño is crisp, fresh and elegant with aromas that include white peach, apricot, pineapple, honeysuckle and melon. Medium bodied with ripe fruit flavors and lower alcohol levels around 12 percent, Albariño is an ideal wine for summer evenings. And, it is a wine that pairs beautifully with several dishes, ranging from seafood to spicy international cuisines such as Chinese, Indian and Thai. Adegas Morgadí is located in the sub-region of Condado do Tea and is the easternmost inland estate of DO Rías Baixas. The inland location has a mild climate, southern exposure and granite soils. Morgadí, which means “only son”, was created in 1984 and is considered the winery that set the standards for quality Albariño. The wine is a light, clear color. The nose has intense tropical fruit notes and citrus notes come through on the palate, as well as minerality on the finish. I enjoyed this wine with sushi. Located only 150 feet from the Portuguese border, Bodegas Fillaboa is an historic estate with 70 hectares of vineyards. They are one of the only wineries in Rías Baixas that makes its wines from 100 percent estate-owned fruit and are part of the “Grandes Pagos de España”. The cool influence of the Atlantic Ocean, only 22 miles away, and granite-rich soils contribute to the aromatics of the wine. Another clear, bright wine that is a light gold color, it has notes of citrus and pineapple. The wine is fresh and fruity on the palate and was enjoyed with a seafood platter of oysters, shrimp and crab. Located on the Atlantic Coast in the Val do Salnés, known as the birthplace of the Albariño grape, the Besada family started Lagar de Besada in the 1980s. The granitic and rocky soil and cool temperatures contribute to the crispness and mouthwatering acidity in the wine. The wine has citrus and mineral notes and intense acidity and was enjoyed with shrimp ceviche. 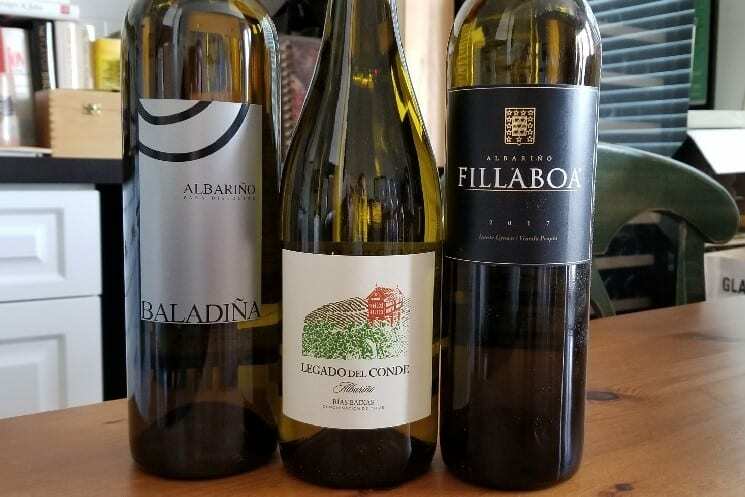 This entry was posted in Wine and tagged Albarino, International Albariño Days, Napa Valley Register, Rias Baixes, white wine, Wine by Allison Levine.